Description: Ice cold, creamy and delicious. Chocolate neapolitan and strawberry, topped with candy, sauce and fruit! Ice cream as cake. How can this not be awesome? Who thought of this? Design your own custom tasty treat and eat it before it melts. Instructions: Use your mouse to click on and through the floating background, cake and flavor accessory options. 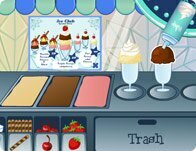 Ice cream can be eaten at any time of the day, and with this ice cream cake cooking game you can make your very own ice cream cake that everyone will love and enjoy.